Yesterday I took part in a great survey organized together by Amphibian and Reptile Conservation Trust (ARCT) and Surrey amphibian and reptile group (SARG). The site, called Frimley Fuel Allotments and located near Camberley covers around 100 hectares. Half has been leased to a golf centre, the remaining half is managed by a local charity which does conservation tasks to preserve the heathland. 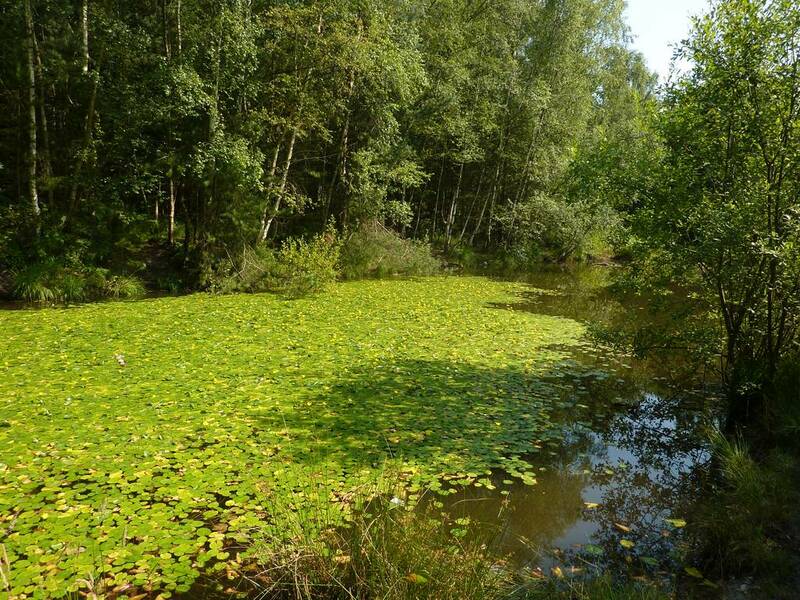 Some parts are wooded with pines, other parts are more open with birch trees, and there are small ponds scattered on the area. On the site, 12 “reptile tins” have been placed and are regularly checked. Those are simply sheets of iron laid on the ground, which serve as artificial refuges for the snakes (thus providing a good way to survey!). The ecologists decided to check each of these tins, and to do a butterfly transect between each tin station. 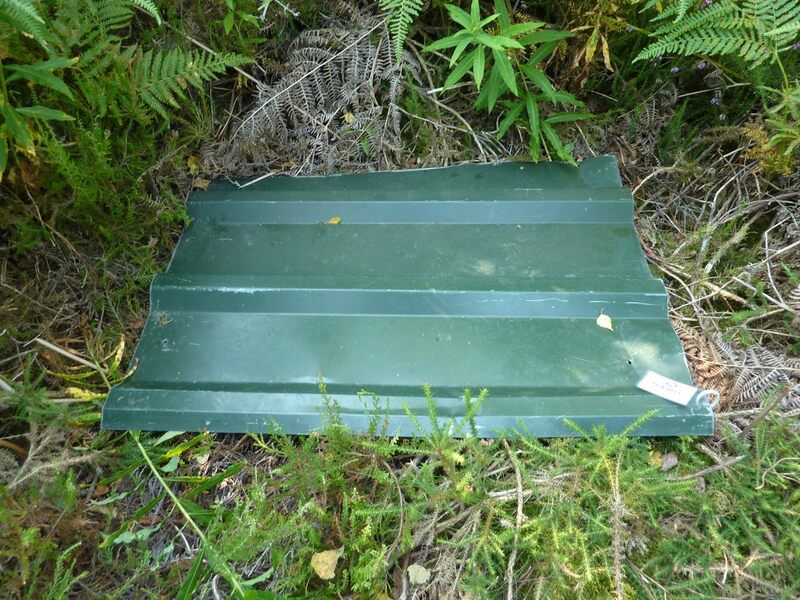 Under the first tin, we got really lucky : there it was, a medium-sized adder, crawling slowly under the ferns! 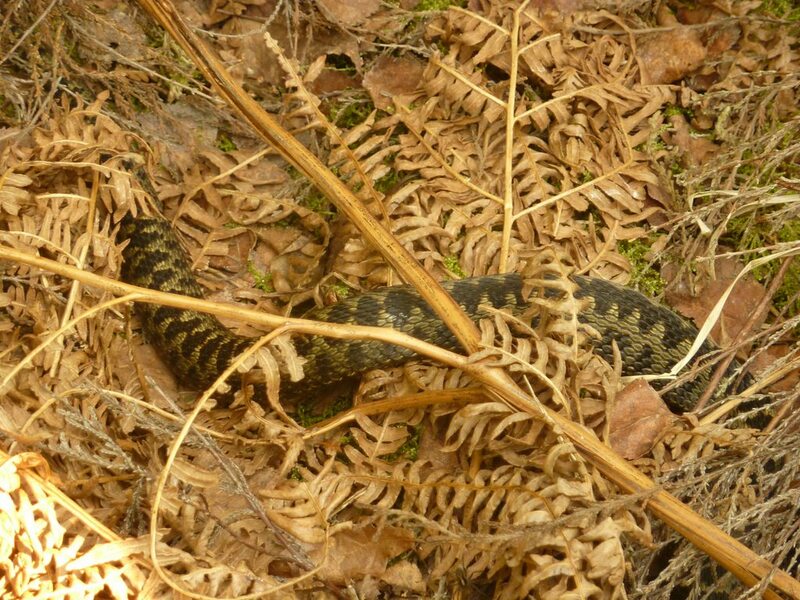 Two other tins had a snake under it : one was a young adder, and the other one a very large male. The one pictured here is probably a male, although even the specialists did not seem to agree! Males are supposed to be light brown with a black zigzag marking on the back, whereas females tend to be brown with a dark brown zigzag. The butterfly transect was quite successful too. We got a nice list : Small Skipper, Large White, Meadow brown, Ringlet, Gatekeeper, Speckled Wood, Comma, a Fritillary…and probably others that I forgot! 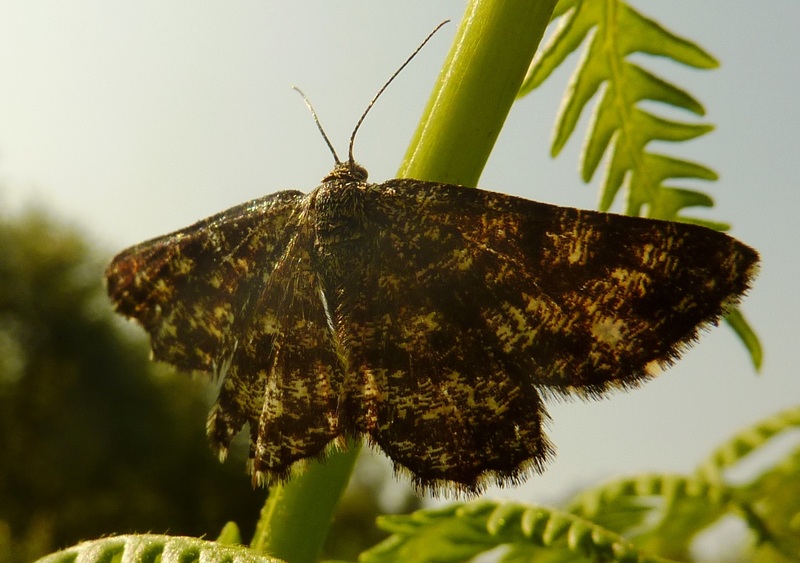 Here is a nice moth I noticed on Bracken fern : it’s called the Common Heath (Ematurga atomaria) and it’s a heathland specialist, with its larva feeding on two characteristic plants, heather (Calluna sp.) and heath (Erica sp.). Butterflies and reptiles were not the only thing we found in this site. Around the ponds and streams, we saw two large dragonflies : Brown Hawker and Common Hawker, as well as Common blue damselflies. 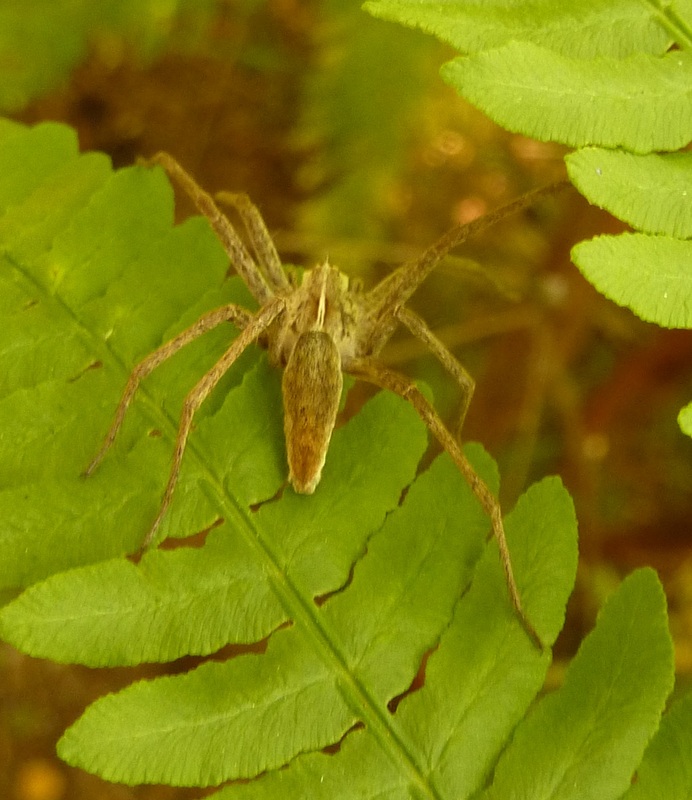 If you’re not afraid of spiders, check this one : this is the nursery web spider (Pisaura mirabilis), quite easy to ID because of its large size and thin cream line on its back. 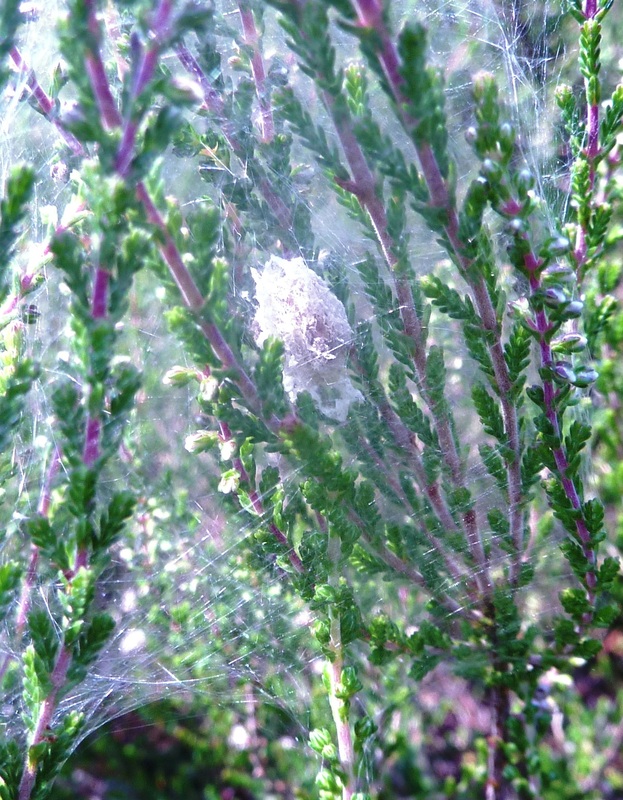 The second picture shows the web (which she doesn’t use to hunt, contrary to many spiders) and cocoon. 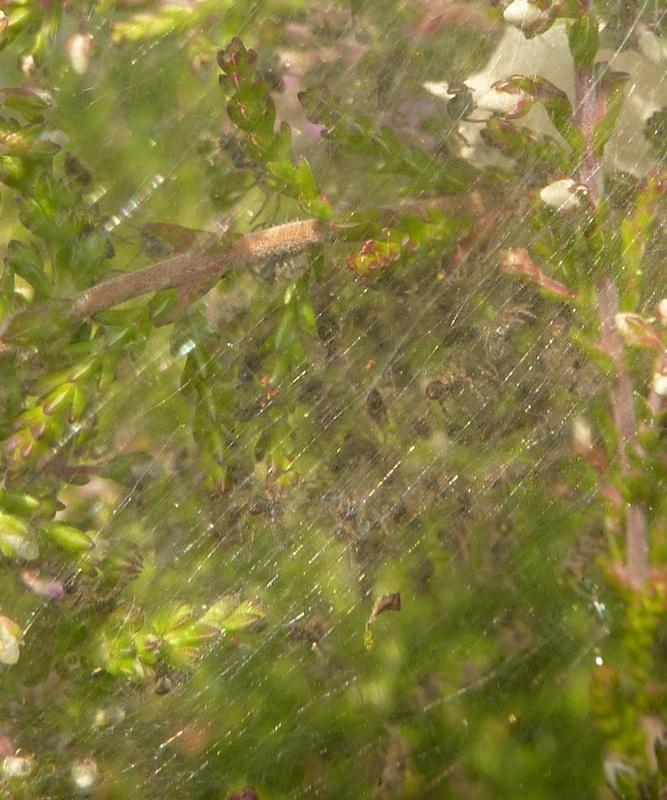 On the third one, if you enlarge it, you can actually see many young spiderlings! 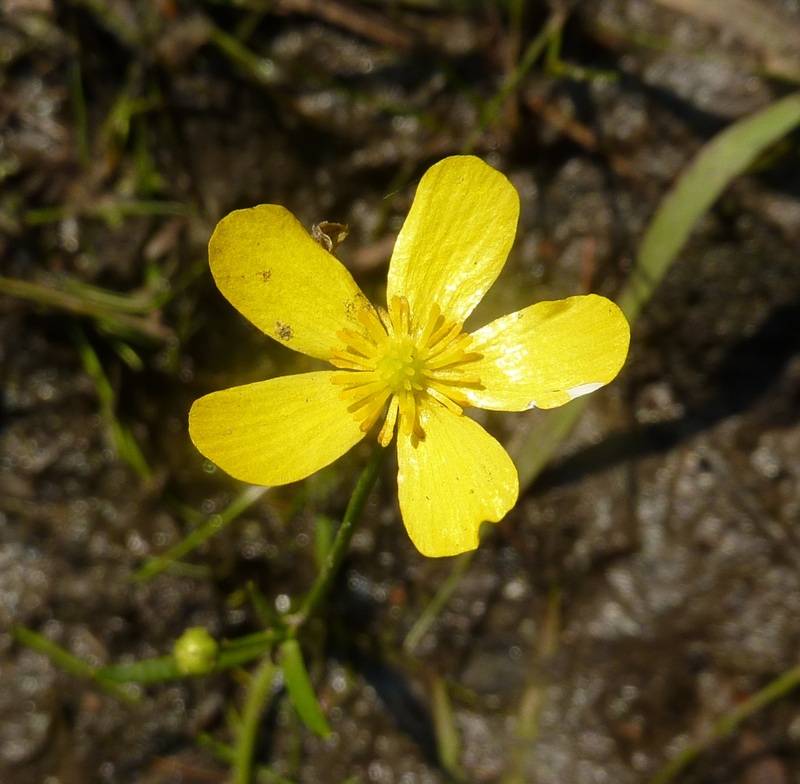 Now a bit of botany, because the site is also very interesting for its plants. Two common heathland bushes, which both have yellow flowers, and both belong to the pea family (Fabaceae). 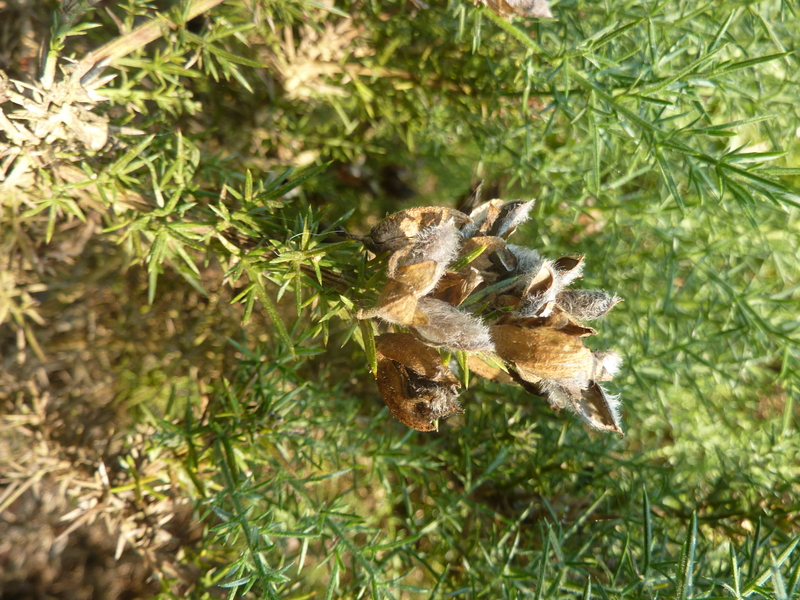 The first one, Gorse (Ulex europaeus), has vicious spines and short seed pods, hairy when ripe. 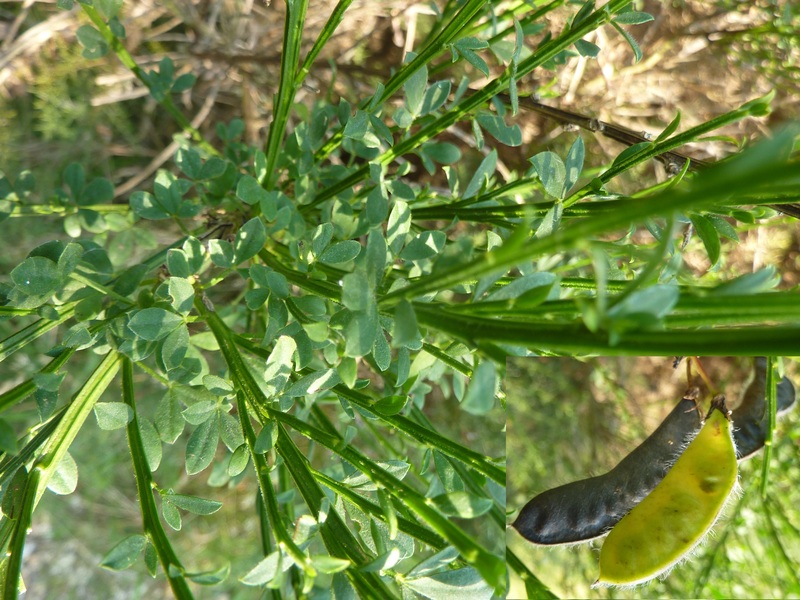 The second one is Cytisus scoparius (or Broom, because it was used to make brooms!) with no spines, and a longer, flattened pod. 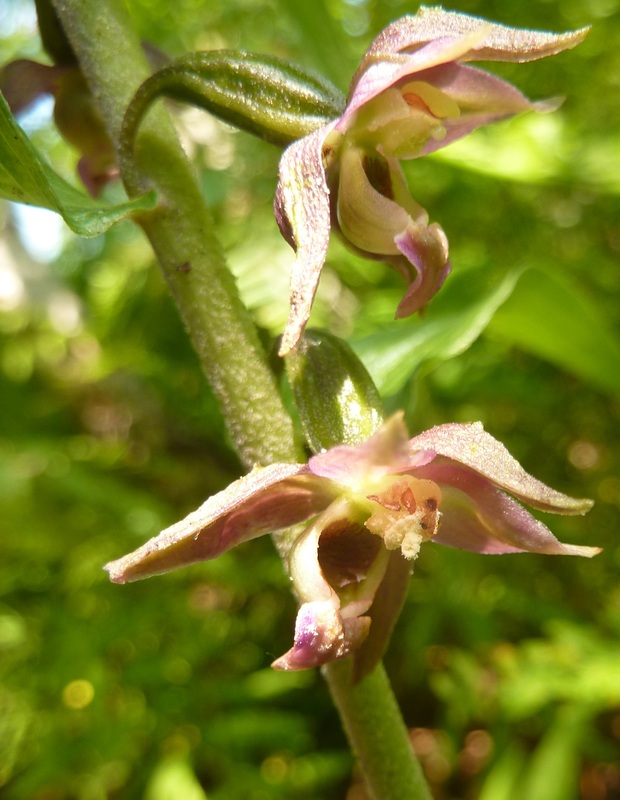 A creeping, water-loving beauty related to buttercups, Ranunculus flammula (Lesser Spearwort) and a woodland orchid, which seems to thrive around here, Epipactis helleborine (the Broad-leaved Helleborine). In the afternoon, we did some bracken pulling. 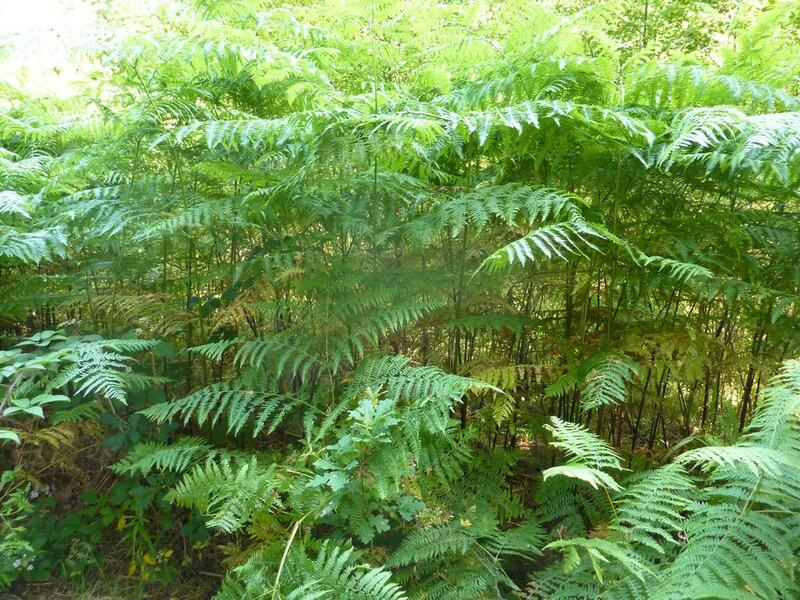 Bracken (Pteridium aquilinum) is a native and rather pretty fern, which can grow up to 3m tall. It thrives in acidic soils, and can rapidly overgrow heather and other low heathland plants. 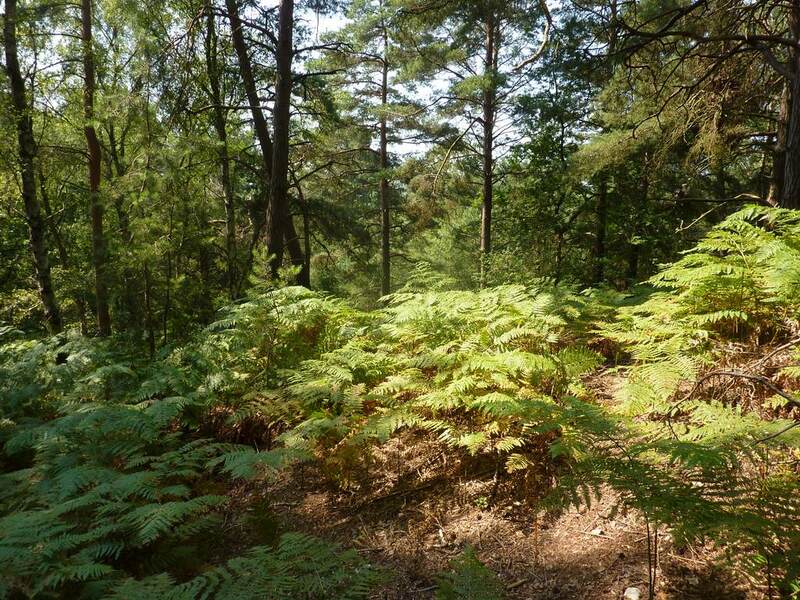 In the past, bracken was grazed and harvested, but those activities have declined, and the plant is starting to conquer many heathland areas. 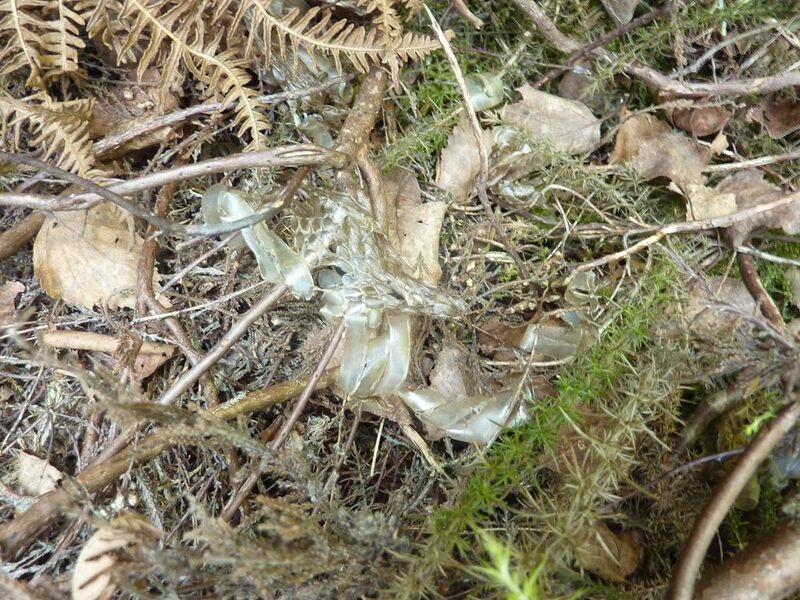 It’s a nasty fern though, because the whole plant (and particularly the spores) contain carcinogenic compounds.